Most of us have some big and some small things that they can do to better the cost efficiency of home. Whether you just want to drop a few dollars off of your gas bill or you are looking for a better way to fuel your home altogether, doing just a few things can make a tremendous amount of difference in your home. Why bother with cost efficiency? Many people will be shocked to learn that they can lose up to 25% or more of the energy in their home without the need to. You literally could be flushing your money down the drain. The good news is that making your home energy efficient does not have to be overly challenging. It also does not have to be overly costly either. There are plenty of things that you can do to better your home’s ability to use energy more wisely from just about every aspect you can imagine. 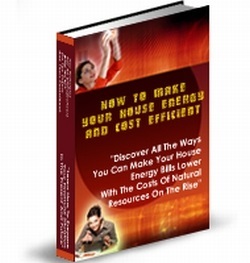 Throughout this ebook you will learn things that you can do right away to improve the energy efficiency of your home. You will also learn different ways to save money on everyday needs that you have. You will find yourself saving money and living in a more efficient and environmentally friendly home.